The Dolomites are a limestone mountain range, that is known for its natural beauty in the form of steep cliffs, pinnacles and ravines. They form part of the Alps. As I had planned a full day of driving around the Italian Alps anyway, why not try to reach an inscribed area of the Dolomites? The most easy option is to go for the Brenta Dolomites, a mountain range about half an hour north of the Fiavè Pile Dwellings. As I was travelling in mid-December, I opted out of the drive on the northern mountain passes via Madonna di Campiglio as they surely would be covered in snow. I decided to try a southern loop, starting from Capo di Ponte (Valcamonica WHS!) via Bagolino. The first 10km went great, the weather being unusually warm and sunny for the time of the year. There was no snow on the ground in the valley either, and only little of it on the mountain peaks. At a turn-off though I was stopped by a sign ‘Crocedomini – Closed’. This really is a minor road (SS669), it can be beautiful in summer and I hope someone out will try it out for a review on this website. To me it meant that I had to drive back all the way to Brescia, and go for the full southern approach: driving north on the highway to the Brenner Pass. That was the moment that I lost the tiny bit of time I had left in the itinerary for lunch…. The different approach went well, and I arrived at the “Dolomites viewing destination” Lake Molveno at 2.30 p.m. The core zone of the Brenta Dolomites (area number 9 in the WH nomination) rises up just behind this Lake. I had wondered how I would be able to distinguish them from all the other mountains in this area, but that proved to be no issue at all. Their shapes and colours are so different from the “regular” Alps. 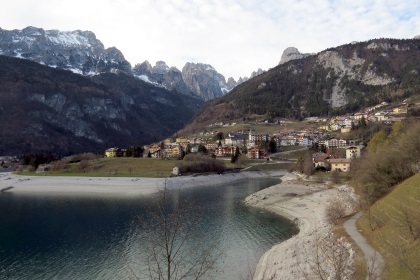 Lake Molveno is an excellent viewing location, delivering a kind of image that is popular in jigsaw puzzles. I stopped at various spots around the lake, and saw it once more from a distance near Dorsino. Of course I would have liked to spent more time exploring these mountains, hiking at high altitude for example. But this short drive-by visit did allow me to take in the OUV (the beauty of the mountain landscape) of the core zone of one of the parts of this WHS. Due to some short term change in plans I found myself with a week to spend for private travels. Seeing flight prices at very short notice were unreasonable and having some bonus miles to spend with Deutsche Bahn (German Rail) I settled on the Dolomites. I got myself a train ticket from Hamburg to Bozen (Bolzano) in Südtirol (South Tirol). And off I went. The Dolomites had been on my to visit list for a while. I enjoy mountains and some hiking. And the images of Drei Zinnen (Tre Cine) are iconic. Last but not least, Südtirol is one of those standard German vacations. It's not on the level of Mallorca, but certainly on par with the Lago di Garda. And I wanted to know what the fuzz is about. I spent two nights in the area and explored two parts of the inscribed site: Schlern-Rosengarten National Park and Drei Zinnen National Park. According two Hubert these are also the best two locations of the site. But me visiting precisely those two was more of a coincidence. To me Drei Zinnen is the more iconic site while Schlern-Rosengarten offers better hiking options and gives a better overview of the diverse landscape. In Schlern Rosengarten I crossed the mountain range from Seis to Weißlahnbad. While not as excruciating as my adventure in the Sardonic Alps with Philipp, this was still a strenuous hike. Especially coming down to Weißlahnbad was quite a challenge. Looking back it was really a pleasure visiting. Italy has added yet another great region to my already long list of great regions of Italy. The region of Südtirol where most of the national parks are found is historically German/Austrian and nowadays bilingual. Being German I use the German place names; I can't recall the Italian ones, but generally you will always see both. Google maps is incomplete and not really helpful. I recommend using the app of the local transport authority for Südtirol. I also recommend getting the Südtirol hiking app to follow the trails. Prices in Südtirol are the most expensive ones I have ever encountered in Italy, even topping Venice and Rome. My hunch is that it's just too damn close to Munich and us Germans are spoiling the prices. Bozen is probably the city in Südtirol you can reach the easiest. There are regular trains from both Verona and Munich/Innsbruck. In Bozen you can already see the glorious Dolomites including the inscribed area of Schlern Rosengarten. To get to Schlern Rosengarten National Park take a bus to Seis from where a cable car takes you onto the Seiser Alm. If you are so inclined you can start your hike there and cross to the other side. The other option is to go to the Southern side where also the information center of the National Park is located. Take a bus to Weißlahnbard (not so frequent) or to St Zyprian (more frequent, but requires a bit of walking). If you plan to travel on from Bozen there are luggage storage facilities at the train station. The opening hours are not perfect and it's quite pricey, but well. Drei Zinnen is best accessible from Toblach. From Toblach there are direct shuttles up the mountain to the Auronzo hut. You can continue a hike around the mountain range to the Drei Zinnen hut where the view is excellent. The significantly more strenuous side is the clockwise side, so start counter clockwise and see how you manage the easier side before going all in. Getting to Toblach from Munich is easy as you can transfer efficiently in Franzensfeste. Getting to Toblach from other parts of Italy meanwhile is quite time consuming. Even from Bozen it's 2h. From Cortina d'Ambrezzo it's 1h, but that doesn't help all that much as Cortina itself is remote and time consuming to reach. I think it took me 5h to get to Conegliano (T) on the footsteps of the Alps on a Sunday. Admittedly, this was also due to the massive traffic jam that formed as all Italians were heading back to their homes after a weekend spent in the Alps. Bozen and Südtirol in general are really pleasant places. Landscape and food is great. I do understand why German tourists flock here; it's not just about the language. From Bozen you can continue onwards to Verona and all Northern Italian sites. You also have the option to go to Meran and cross into Switzerland for the fabulous Müstair monastery. In my case I travelled onwards to Conegliano for the Prosecco Hills (T) and from there I went on to Venice. I visited this WHS in May 2014. It was my 200th WHS so I was very excited to visit. I drove through different mountain passes and could easily discern the Dolomites from the other mountains and high hills because of their jagged nature. I was lucky enough to visit on a sunny day and I didn’t encounter any problems on the road. I tried the minor road SS 669 and I must say that there are pretty villages that are worth stopping at with splendid views of the Dolomites. I particularly enjoyed San Lorenzo in Banale which is marked as one of the most beautiful towns in Italy and rightly so. I brought lunch with me and made a picnic at Lake Molveno which is a natural beauty in itself offering unobstructed views of the Brenta Dolomites. A cable car is currently being constructed so in the near future it will be possible to access the mountain peaks from a closer range directly from Molveno. I suggest spending at least a week if you love hiking (or skiing in winter); you won’t be disappointed! Covering a large part of Northern Italy, the Dolomites are one of the world's most recognizable and scenic mountain ranges because of their unique geology and rock formations. The WH site covers a selection of nature reserves spread across 3 regions and 5 provinces. They are well-known as a paradise for hikers, but the WH core area can be a bit tricky to reach if, like me, you rely on public transport and are not too keen on long hikes (but appreciate the fantastic scenery). The best and quickest route to get into the WHS core area by bus seem to be the regular connections from Cortina d'Ampezzo (a nice base if you also happen to collect Olympic host cities) to the Auronzo Hut, at 2,320 metres above sea level (there are also buses from Toblach/Dobbiaco). This quite well-equipped rifugio (restaurant, terrace, bathrooms) is set at the foot of the famous Drei Zinnen (Tre Cime) formation in the Sextener Dolomiten (Dolomiti di Sesto) Nature Reserve. From there, you can reach the Lavaredo Hut on a fairly level trail in about 20 minutes. 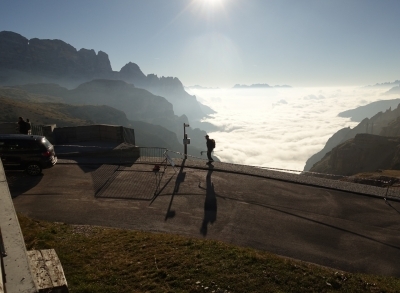 This short walk gives you great panoramic views over a large part of the Dolomites. Beyond this hut, the trail gets rather steep, and anyway, I had to return to the Auronzo Hut to catch my bus back to Cortina. If you are lucky with the weather, this is really a great way to spend a day out in the mountains. Because there are no railways within the Dolomites, I rented a car from Bolzano station to explore the area. I decided to stay at Passo Costalunga, near Vigo di Fassa. From there I made excursions to various areas within the huge Dolomite area. One day I went to Marmolada (area 2) via Canazei and hiked around Lake Fedaia. Then I drove to Malga Ciapela and took a cable car to the summit of Marmolada. Later I returned to Canazai via Livinallongo, Arabba and Passo Pordoi all of which provided splendid views of the mountains. Another day I drove via Aldino and the Rio del Foglie gorge (area 8) to Lake Molveno and the Brenta Mountains (area 9). On the way back I stopped at Spormaggiore village to visit the bears and wolves in the forest nearby. I drove through the Sciliar-Catinaccio (area 7) to reach Castelrotto, then continued through the Val Gardena, over the Passo di Sella and returned via Canazei. 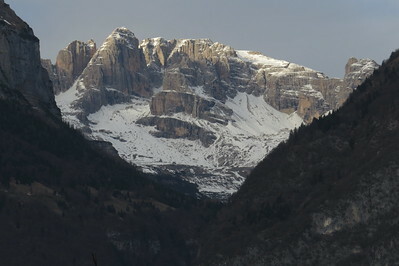 The last excursion was to the verdant area of San Martino di Castrozza, overlooked by the towering Pale di San Martino. Stopped to hike from the Passo di Valles to view the massive Vezzana peak. Driving in the Dolomites was more relaxed and pleasant than any I had seen in other parts of Italy. 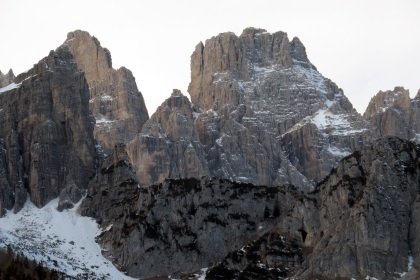 It's hard to believe that this is the first review of this WHS, because the Dolomites are a popular destination for passionate hikers and climbers. But many of the most popular destinations are also accessible for less experienced hikers. The disadvantage is, that some of the trails are very crowded, at least in summer. At some moments of our hiking tours I felt like I was in a shopping center on the day before Christmas. However, I can understand this enthusiasm. With its various spectacular forms, the Dolomites are unique among the alpine landscapes. Steep peaks and pinnacles tower over green foothills and offer plenty of magnificent panoramic views. During our week-long stay we have made several tours in four of the nine inscribed areas. 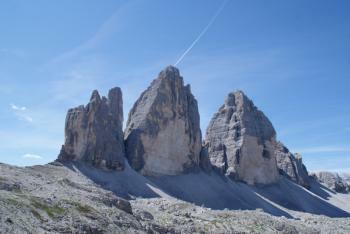 Of course, we went to the Drei Zinnen/Tre Cime, probably the best-known place in the Dolomites (area 5). We started at the car park near the Hotel Tre Cime (at 1400 m) at the road between Toblach/Dobbiaco and Cortina. The path leads through the Valle di Rienza and the Valle di Rinbon to the Drei Zinnen hut (at 2400 m), from where you have an amazing view to the Drei Zinnen (photo). The last part is very steep and you have to be in good shape. We walked back through the Valle di Rimbian, the tour took us about 8 hours. But you can also make it easier: by car or bus to the Auronzo hut (road charge) at the rather unspectacular south side of the Drei Zinnen, then an easy 2-hour-walk to the Drei Zinnen hut. 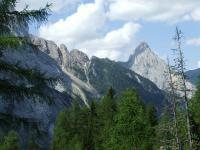 Another very popular tour leads around the Rosengarten/Catinaccio massif (6 hours, area 6). A chairlift took us to the Kölner hut at 2300 m. The first part of the trail was very steep uphill and only for trained hikers, but most of the trail was suitable for less experienced hikers. A third long hiking tour (9 hours) was through the Langental to the Puez hut, the Crespeina plateau and the Cirspitzen/Pizes de Cir (area 7). The Bletterbach gorge (area 8) is the smallest of the inscribed areas. We started at the visitor center of the geological park and walked about two hours along the creekbed to a waterfall at the end of the gorge. The trail was very rocky but not difficult to walk. In the gorge, various rock strata of the Palaeozoic and early Mesozoic eras can be seen. Several notice-boards provide information on the geology and on plant and animal fossils that were found in the gorge. There are also a lot of possibilities for short and easy hiking tours: at the Zanser Alm in the Val di Funes you can choose between tours of various lengths, all offers beautiful views to the Geisler massif/Odle (area 6). Other popular destinations that are easily accessible are the Pragser Wildsee/Lago di Braies (area 5) or the Seiser Alm/Alpe di Siusi (area 7). We stayed in Brixen/Bressanone for the whole week. Bressanone is a charming town with a beautiful cathedral, narrow streets and many restaurants and bars. All in all, it was a great week in the mountains and surely I will come back to visit the other inscribed areas. 3.5: Solivagant Craig Harder Klaus Freisinger Philipp Peterer Peter A.
Glaciers: Marmolada Glacier is the only large glacier in the Dolomites. Some experts have suggested that it "could disappear in 20-30 years from now. In 1960s, the glacier surface counted some 3.5 square kilometers. In 47 years it was down to 1.75. Furthermore, in 1980 the surface of the highest rocky crest was about 10 meters high. Today it has almost disappeared." 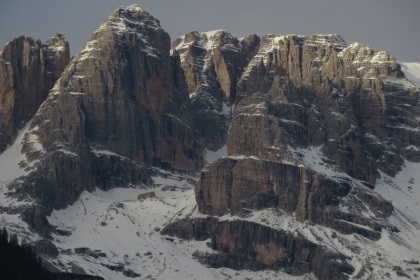 Star Wars: The Tre Cime di Lavaredo peaks in the Sesto Dolomites were used as the backdrop to the train heist on the snowy planet Vandor in the Star Wars prequel story Solo. Reduced from broader TWHS: TWHS originally included further sections of the Alps including the Western Alps.